Will the battle between fire and ice come to and end? 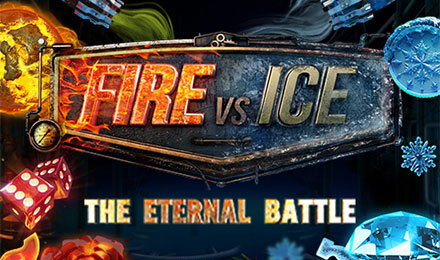 Discover the amazing treasures hidden for you in Fire Vs Ice slot. With jaw dropping bonus rounds. Is it shocking that the two extreme elements are still at war? On the 5 reel and 25 payline slot experience the true power on Fire vs Ice slot. Embedded with amazing graphics and fiery and icy symbols, get ready for the experience of a lifetime. Symbols like frozen bars and flaming die will be sure to reward you. When three or more fiery Free Games symbol land on the slot grid, get ready to receive free spins and gain the full experience off the game.